St Croix restaurants range from casual cafes and roadside food stands to elegant, high end gourmet eateries. Here's where you'll find my personal picks for restaurants on St Croix, based on my own experiences and the experiences of trusted friends. Remember, this is by no means a comprehensive list, so give 'em a try, but don't limit yourself to these restaurants only. And if you find other places you enjoy, let me know about them! Cane Bay Bar & Grill: Right across the street and overlooking Cane Bay. Very pleasant open-air terrace type setting, very casual and "beachy". Good, basic fare (I'm really enjoying that burger!) at very reasonable prices. Kan Yuan Seafood: Chinese food; despite the name, they serve a full-range Chinese menu, not just seafood. Very good, popular with locals and visitors. At Five Corners on the western outskirts of Christiansted. Turtles Deli: Just south of Frederiksted, right on the beach, they make nice overstuffed sandwiches for very reasonable prices. You can eat right there by the beach at one of their outdoor tables. Beach Side Cafe: Just south of Frederiksted, at the Sand Castles on the Beach hotel. Very good place, nice open-air terrace location; serving Continental, American, and Caribbean dishes, always tasty and well-prepared by truly professional chefs. Closed Tuesdays and Wednesdays. Breezes: At Club St Croix, just up from Colony Cove, on the coast just west of Christiansted, this place offers a great selection of international dishes. Try the "Chocolate Oblivion" for dessert! Duggan's Reef: One of the most popular St Croix restaurants, great service and maybe the best lobsters on St Croix. Their Irish Whiskey lobster is fantastic! So's the lobster "in the buff" (plain, baked lobster). They also offer a full menu of lunch items and an elaborate selection of dinner fare. On the northeast coast, right on the tranquil waters of Reef Beach. 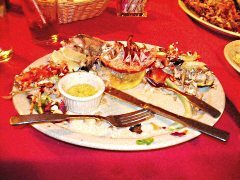 Remains of my Duggan's Reef lobster... YUM! The Island House: At Chenay Bay Beach Resort, a casual beachfront bar & grill serving very good, solid fare. Rum Runners: Serving breakfast, lunch, and dinner, this place is in a great location right on the boardwalk of the Christiansted waterfront. Great American and Caribbean cuisine, plus sushi in the evening. Savant: Creative fusion of Mexican, Thai, and Caribbean Cuisines; fresh, tasty ingredients; well-prepared. On the eastern edge of Christiansted. Kendrick's: Right in Christiansted at the Quin House complex (at King Cross and Company Street). Beautiful, elegant atmosphere and delicious gourmet food. Try the pecan-crusted roast pork. Yum! The Mahogany Room: A combination of international cuisines, considered by some to be the best of all restaurants on St Croix. The menu changes frequently, but offers truly gourmet-quality meals in a beautiful,upscale ambiance. Located at the luxurious Carambola Beach Resort on the northwest coast of the island. Remember, this is just a sampling of St Croix's restaurants. There are many others not listed here. By all means, explore other places that catch your fancy. After all, that's part of the fun of going on a vacation!